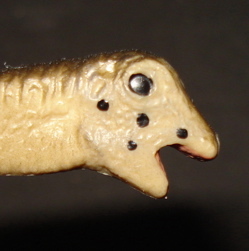 The Carnegie Saltasaurus is a dynamic replica Dinosaur toy. 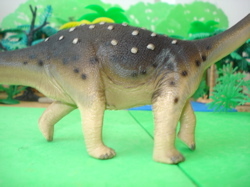 The 1996 Carnegie Collection Saltasaurus (opens new window) by Safari Ltd continued the line's dedication to being educational as well as playful. In this case we have a unique, even ground-breaking, discovery of one of the last of the Sauropods. This one discovered near Salta, in Argentina. Our Carnegie replica of this 30-40 foot long (9-13 meters) and 7-10 ton beastie weighs in at 4.25 oz (119 gms) and measures one foot (12", 30.5 cms) in length. Perfect 1/40 scale at the upper size limit. What makes the Saltasaurus such an interesting choice is that is was the first Sauropod to be found with actual, Ankylosaurus-like, armor. This took the form of "scutes", or armored scales (much like the earlier, Permian Scutosaurus) and possible spines across its back. This would have made it impossible, or at least difficult, for a potential predator to have leapt upon it and cause significant injury. Prior to this discovery it had been believed that all Sauropods needed was their huge size and whip-like tails to protect them. The discovery of this armored, passive, protection has led to a re-evaluation of other Sauropods as well. After all, what else do we have to do? ...and so the somewhat surprised expression on their face is quite justified. Speaking of "expressions" one wonders how such a small head could have kept such a large animal well fed. They must have been just unceasing eating-machines. You would expect an expression more in line with exhausted. 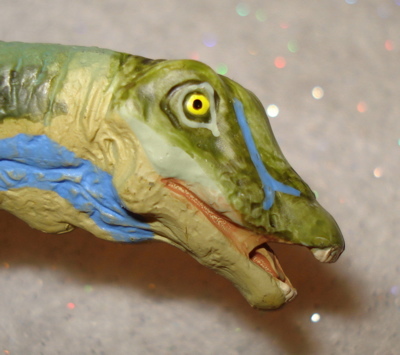 The face of this Carnegie Saltasaurus I find to be rather fetching and cute. Depending on what is happening around him the face looks alternatively surprised, excited, happy or hungry. Quite a range! Overall the Carnegie Saltasaurus is a rather svelte and elegant replica. And families too, in this case from Safari Ltd., get hungry and make demands. The big thing about being Dinosaurs instead of Dinosaur toys is that the latter have many more predators to be concerned about. Nature certainly can be fore-thoughtful about providing for the toys of the future. Can't it? 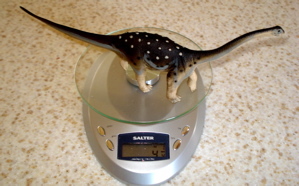 The Carnegie Saltasaurus is a very nicely crafted figure, especially considering its age. It came out in 1996 and is effectively part of the Carnegie Collection second-generation of figures (1995-2005). We are now in their third-generation (2006>). The head is rather simplistic and actually ostrich-like, mindful of the MARX Struthiomimus. 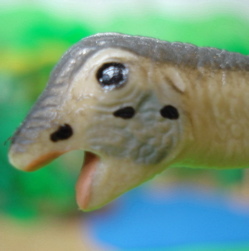 One must keep in mind that this is a Dinosaur toy and this head has the very real benefit of being highly expressive. But it is arguably the weakest part, realism wise, of what is an excellently done figure. 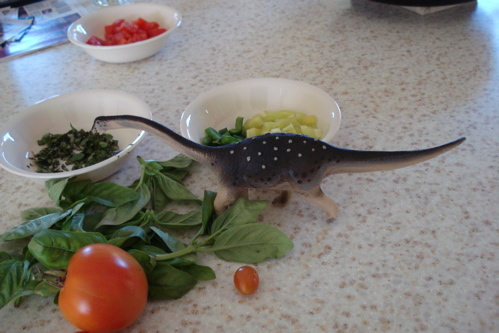 Dinosaur toys are particularly susceptible (for herbivores) and capable (for predators) of surprise appearances. Nobody minds when food shows up! "Oh poop! Another darned time-traveling predator." 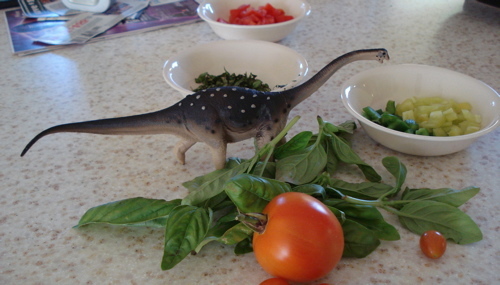 Saltasaurus can make a pest of themselves when you are trying to make a salad or cook a (non- Dinosaur toys) dinner. Train yours to stay off the counters. ...right down to the well detailed feetses of this active Sauropod. A particularly nice aspect of this figure is that the legs on the right side are straight and unmoving, those on the left are dynamically and actively posed. Thereby creating a dynamic sense of movement. This provides for a wonderfully playful Dinosaur toy presented in a very well thought out fashion. Continuing with our 'predators from other places' theme we find a pack of (OOP 1997 Carnegie) Deltadromeus (Delta-runner), twenty-five foot predators from North Africa who are sightseeing. Checking out the menus on foreign continents. ...we see it is a trim little fellow from every angle. Imprinted on the belly-of-the-beastie are the figure's name, manufacturer (place and company) and year as well as the Euro-Union safety sigil. South America was a separate island continent during the Cretaceous period. Just like Australia today it was populated by unique creatures, often survivors of populations in decline in other parts of the world. 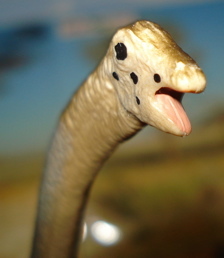 By the Cretaceous Period Sauropods had been largely replaced by Hadrosaurs and Iguanodons as the most common herbivore in most parts of the world. On the South American island-continent, however, Sauropods remained predominant. Included among them was the 120 foot, 80 ton Argentinosaurus, a giant Sauropod! Also unique to S.A. was a predator with the size to properly predate the predominant plant-eaters of the island, one that could readily pick on the condimentish Saltasaurus. Giganotosaurus was a Theropod slightly larger than the Tyrannosaurus and generally larger than Saltasaurus. Those armored backs would certainly come in handy "under the gun" when that gun is enamel. At least the Giganotosaurus is a 'natural' predator of the Saltasaurus and not just another annoying Touristosaurus. 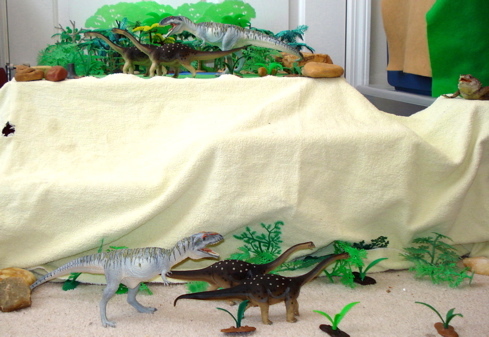 The great thing about Dinosaur toys is what we saw in the movie Jurassic Park. We can mix and match with the creatures, one era from another. And not be bothered by historical reality while playing with realistic replicas. Way cool! 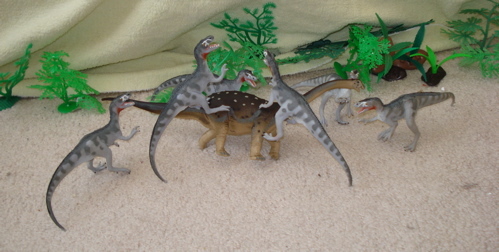 The Carnegie Saltasaurus, as noted, came out in 1996 and has remained in continuous production now for fourteen years. This says a lot for the popularity of what is essentially a little known Dinosaur. I would like to thank Safari Ltd. for providing the Saltasaurus herd roaming this page. Despite the broad range of predators faced this Dinosaur toy combines realism with rugged and can be expected to easily survive years of both active play and playdation. 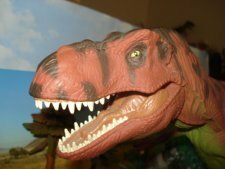 Being in current production it can be found in brick & mortar stores that sell Carnegie Collection Dinosaur toys as well as on the internet. Ranging in price from $7.49 to $10.99 the pure longevity of the figure implies popularity implies eventual collectibility but excessive inventory. Much like with the MARX Dinosaur toys eventually these will be in greater demand than can be met. Presuming that they eventually do go out of production. Good luck with that. I like this figure very much myself. 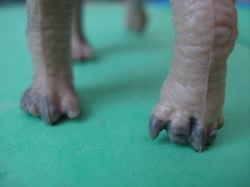 It combines dynamic posture with current levels of realism in Dinosaur toys. It is of a popular scale (~1/40) and works and plays well with others. Particularly children, other Dinosaur toys and adults who care. It is edible as indicated by passing the plethora of tests that the USA environmental health institutes now require (lead free, no pthalates, etc) and has the Euro-Union imprimatur of non-toxic health, the now ubiquitous "CE", indicating toxicity levels acceptable for the menus of members of the European Union. On the other hand the taste is overly bland, they are quite chewy and have no nutritional value. They make much better toys than tasty treats. But they won't kill you if you eat them. Don't eat them. Play with them. They are NOT RECOMMENDED for Children under the age of three (3). We hope that you have enjoyed reading about The Carnegie Saltasaurus and will tell all your friends. You can read about other Sauropods by clicking this link to our main Sauropods page. 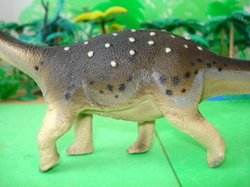 You will find links to other Dinosaur toys of a Sauropodal style there too.